DoubleDragon Properties Corp.’s mall unit has acquired a new property in Aklan, further gaining ground on its plans to operate 25 CityMalls by end 2015. In a disclosure to the local bourse, the property joint venture of the founders of grilled chicken chain Mang Inasal and fastfood giant Jollibee Foods Corp. said it has recently cornered a 1.1-hectare prime commercial lot in Kalibo, Aklan. 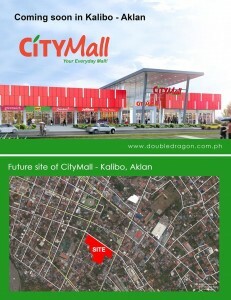 DoubleDragon said the property is situated within the commercial and residential zones in the town proper of Kalibo. “Kalibo serves as the major commercial and educational center of the province and caters not only to the people of Aklan but also to transients coming from other nearby provinces, cities and countries,” DoubleDragon said. The property firm earlier this month secured through its subsidiary CityMall Commercial Centers Inc. (CMCCI) two commercial prime lots covering a total of two hectares in Cotabato City and Pampanga. CMCCI is 66-percent owned by DoubleDragon while the remaining 34 percent is held by mall and banking conglomerate SM Investments Corp.
CMCCI targets a total of 25 operating CityMalls by end of next year. It has already secured 11 prime and strategic sites for the malls to date. “CityMall is set to uplift the community mall standard and is seen to revolutionize the community mall industry in the Philippines,” DoubleDragon said. DoubleDragon aims to reach the P1-billion net income level by 2016 and P4.8 billion by 2020. It targets to reach one million square meters of total leasable space portfolio by 2020, of which 700,000 sqm is expected to come from 100 CityMall community malls, mostly in the Visayas and Mindanao.